The Toronto Argonauts announced the acquistion of defensive lineman Eric Striker from the Saskatchewan Roughriders on Tuesday morning. In exchange, a player on the Boatmen's negotiation list heads the other way. 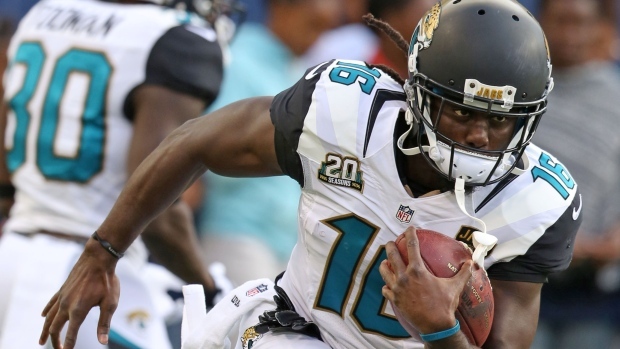 TSN Football Insider Dave Naylor reported that player is former NFLer and University of Michigan star Denard Robinson. Striker, 24, signed with the Riders in April and has appeared in one game this season, coincidentally against the Argos in Week 1, where he made two defensive tackles. A native of Tampa, Striker had a decorated collegiate career, spending four seasons at Oklahoma, where he was twice named an All-American and was All-Big 12 on two occasions. In his Sooners career, Striker recorded 118 solo tackles, including 45 for a loss, 22.5 sacks, four fumble recoveries, two forced fumbles and an interception. Robinson was a quarterback at Michigan but played predominately running back in the NFL with the Jacksonville Jaguars. The 27-year-old Robinson was infamously listed as an OW for offensive weapon for a brief period by the Jaguars. The Argos (0-2) play host to the Edmonton Eskimos (2-0) at BMO Field on Saturday.